My brother sent me an email telling me the university decided to terminate their association with our father. Apparently he is to be cremated next Tuesday! My brother suggested I stop working on Waiouru and pause to have a beer in remembrance. Are you confused? I’ll explain. Dad was both an accountant and mechanical engineer. In retirement he gained a doctorate in computer science. He was also a very good father being compassionate, firm, fair-minded, honest and humble. He was bought up High Church of England, but as a young adult become a “non believer”. Several years ago he was diagnosed with untreatable terminal cancer. He faced his end with his usual stoical courage and set out to minimise the impact of his departure on his family. After tidying up his affairs, dad started researching the cheapest method of disposal for his body. Cremation was cheaper than burial. However as he continued his detailed research into options he develop an intense dislike of the funeral industry. The crematoriums are owned by the local governments, usually via a public trust. The actual cost of the cremation was very reasonable. It was all the additional funeral director costs which significantly increased the total cost of cremation. He didn’t want any of that! But he couldn’t establish a way of getting his body to the crematorium unless he used a funeral director. The government authority wouldn’t allow his body to be transported by any means that didn’t “treat the body with dignity and respect”! During the last few months of his life he unsuccessfully wrote copious correspondence attempting to have “dignity and respect” defined. In the end he decided it was a “closed shop” and he’d never be able to arrange for his body to be taken to the back door of the local crematorium at midnight in a self-made coffin carried in the back of a 6x4 trailer. Then he discovered he could donate his body to the local medical university. Apparently they are nearly always short of bodies. However before he could get around to submitting his application it was suggested to him they probably only wanted nice firm young bodies instead of worn, wrinkly and corrupt one’s with more than 80 years on the clock. He was somewhat crushed, but applied anyway. To the family’s surprise he was accepted! The terms of this type of donation require the university to cremate his remains after they have finished with the body and offer the ashes to the family. Dad saw this as an ideal solution. As a humanist he saw some value to society with the use of body after death. His comment to me was “Doctors need to be trained and research needs to be done!”. The free cremation also appealed to his accountants background. Dad has now been with the hospital for a few years. But he comes home next Tuesday! However I can see this is going to create another problem for poor mum. After dad’s death she would tell anyone who phoned and who insisted on talking to the “man of the house” they should phone the university and ask for Harry Jones. If any mail arrived addressed to him she would redirect it to the university. What is she to do now? When we had our major problem with Ben Harp Narrowboat Builders last year it was suggested to me I should hire a crane, lorry and four “heavies” to go and get Waiouru. I thought about the situation and asked dad “What would you do in this situation, Dad?” Being a very moral and scrupulously honest man I could hear his response in my head advising me “Don’t stoop to the other persons level. Maintain your integrity and reputation for honesty. 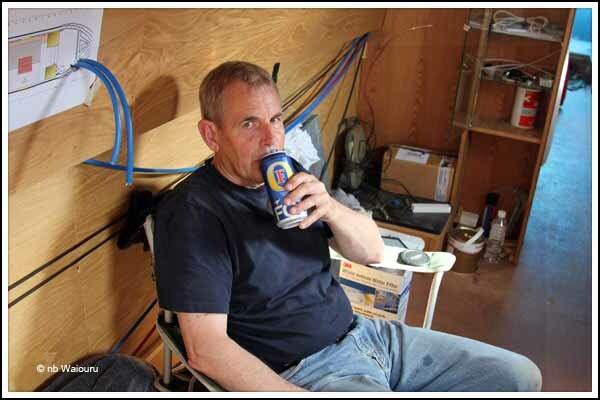 Trust in the law and do the right thing!” Thanks dad…… you cost me an additional £30,000 in legal expenses to get a trashed boat with a zero value! However I don’t believe you can place a price on your integrity and I’m satisfied we morally made the right decision. So I’m having a break from sanding and varnishing to drink a cold lager in memory of a fantastic father! Excellent blog and well done to your dad for going against the system. Sorry you were so out of pocket for doing the ‘right thing’ though. Appreciate you taking the time out to make the post telling us the story. The body donation is something to investigate. Nice to meet you,Tom and Jan, after following your story from the begining. Hope everything cames right soon! Great to meet you and please stay in touch. Great Blog well written and a great epitaph to your father. It will be great to hear the remainder of your story re "Harps" when the law finalizes your dispute! I'm sure your Dad would be proud... Just as you are so clearly proud of him. How is you knitting progressing? I have sort of been distracted with learning how to blog! Don't expect I/we will go 'public' but it will be good to have a photographic record to compliment our ships log. The learning curve just goes on an on when you are retired - all good fun!